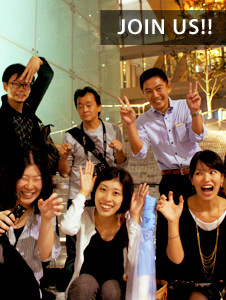 The hottest tour in recent years is the famous Kawasaki Factory Night Bus Tour. Upon news of an upcoming tour, sales agents are bombarded with seat reservations, and within minutes the limited space is fully booked. This is the popular night tour the Lighting Detectives sought to hitch a ride on. The tour would take us to all the popular night viewing spots in the area, as tension escalates with a climatic drive down factory lane! Inside the tour bus. The guide relays facts and history to Lighting Detective members. The bus picked up Lighting Detective members and departed from Kawasaki Station, headed for different observation spots such as Kawasaki Rinko Warehouse roof and Higashi Ougishima East Park. 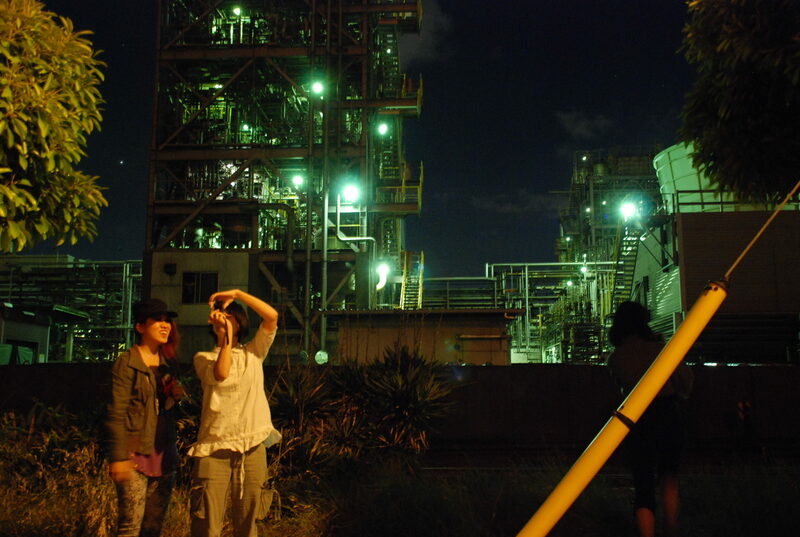 Through the silent darkness along the Port of Kawasaki, bright-white factory security lighting shone like beckons and we could almost feel the heat inside the bus from gigantic flare stacks. Below are three accounts from members on the tour. 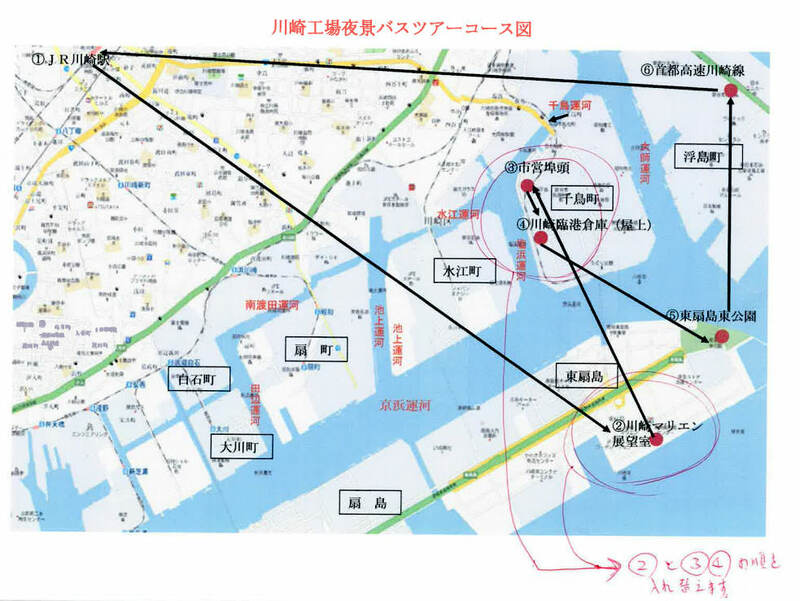 Tour route in the Port of Kawasaki. From here, the bus took the Metroplitan expressway along the bay and ended the tour at Tokyo Station. The lights of a chemical plant. The blueish white light is very futuristic. The view from Kawasaki Mari-en. From here all of the factories and warehouse in the Port of Kawasaki are visible. 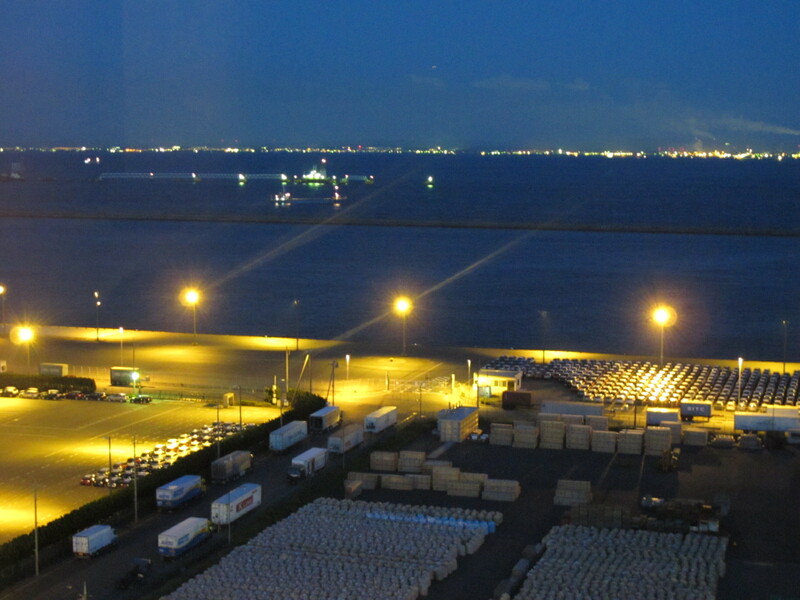 360 degree view of the Port of Kawasaki from the rooftop of Kawasaki Rinko Warehouse. Group snapshot at Higashi Ougishima East Park. 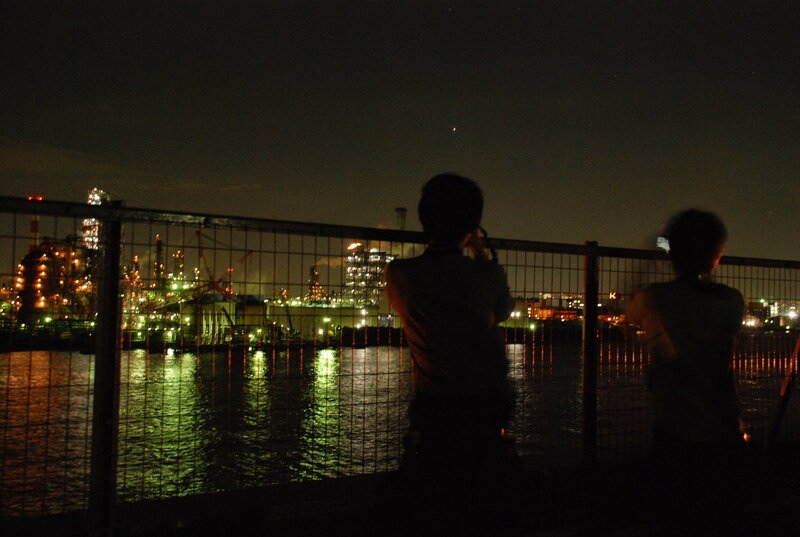 Lights from Futsu, Chiba are visible across the Tokyo Bay. As a collective entity, the points of light seem carelessly arranged, but very beautiful when reflected on the water. 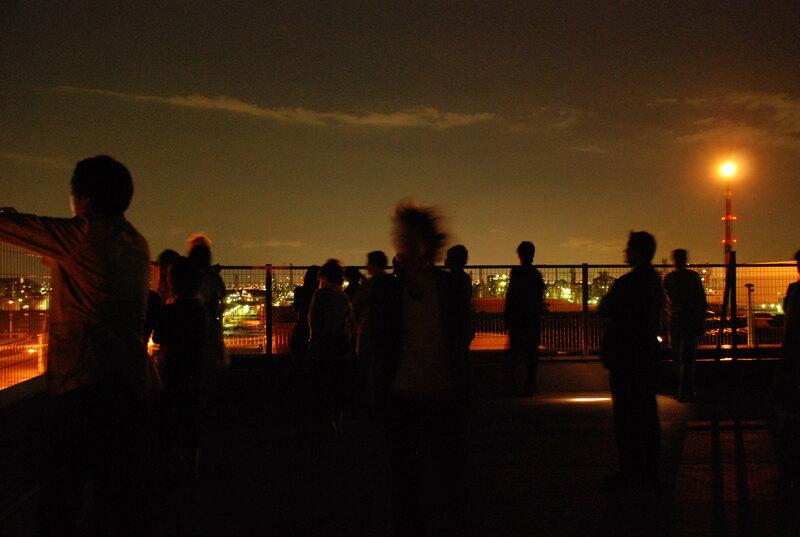 From the observation deck, the area below is blanketed with factories and their accompanying security lights, deposited in the night far from the colorful lights of Tokyo off in the distance. However, on the ground and up close, the silence is broken and each factory is very much alive and working through the night. Bright glaring lights are mounted all over the gigantic machines and the “beast” hunches in the dark with a raging flare stack on top of his head. The flickering flame colors the night sky orange and the surrounding warehouses and network of pipes glow reddish. The factory lights shimmering on the surface of the bay seems to be a living and breathing life form. The collective entity of factory lights is solely functional, but leaves a stronger impression on me than any other lighttcape created for just aesthetic purposes. 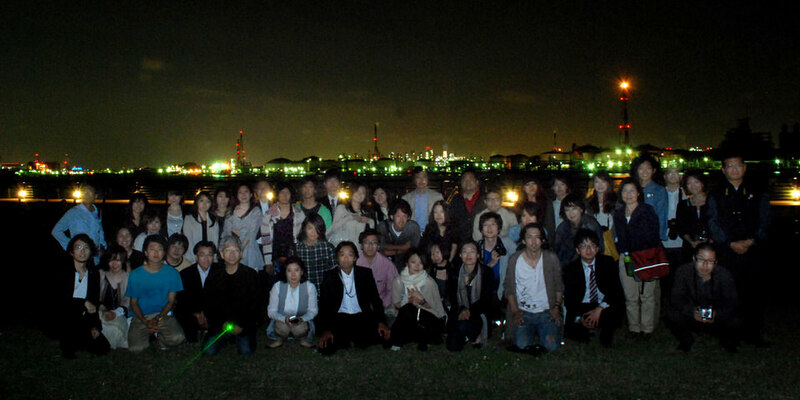 47 Lighting Detective members gathered for the evening start of the Kawasaki Factory Night Tour! First stop on the tour, we climbed the Kawasaki Mari-en Tower and from 50 meters above ground, the observation hall gave us an excellent panoramic view of the factory area. From the hall, the factory lights were laid out before our eyes with Tokyo Tower and the Odaiba ferris wheel coloring the background and airplanes constantly landing and taking off from nearby Haneda Airport. The connection and rhythm between each element in the nightscape seemed to inject life into the city. The next attraction on the tour was the 24-hour smoking and firing flare stack. Overwhelming as it was, the flare stack was a clear sign of the energy and force of the factory operations. The image of factories as an eyesore during the day was dramatically overturned as members on the tour saw the area transformed into a fantastic futuristic lightscape. This was my first city walk with the Lighting Detectives. 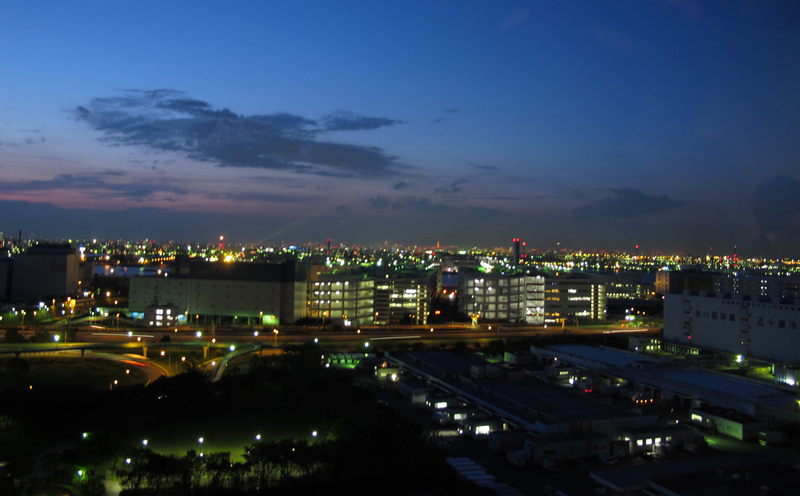 It was dusk, and a light evening sky surrounded us as we departed from Kawasaki Station. As we moved towards the Port of Kawasaki, the sky began to grow darker, like theatre lights being turned down before the performance starts. I was giddy with excitement as we headed to the first stop on the Kawasaki Factory Night bus tour. The view from the rooftop of Kawasaki Rinko Warehouse was the most impressive stop on the tour. After practically running up the stairs, the panoramic view of the Port of Kawasaki laid out from a specially prepared observation deck was incredible. In between the jumble of buildings there was light and shadow, disorderly arrangement of points of light, and several different reflections on the water. It is not a scene I was used to seeing, something I never expected from old warehouses, but almost organic and alive. It was an exhilarating experience to see this unexpected life form and I think most of the other members on the tour would agree that it was an unforgettable view over the Port of Kawasaki.